When asked why he always used storm-damaged wood to make his violins, Stradivarius apparently replied, “Because weather-beaten wood makes the sweetest music.” Beautiful response. 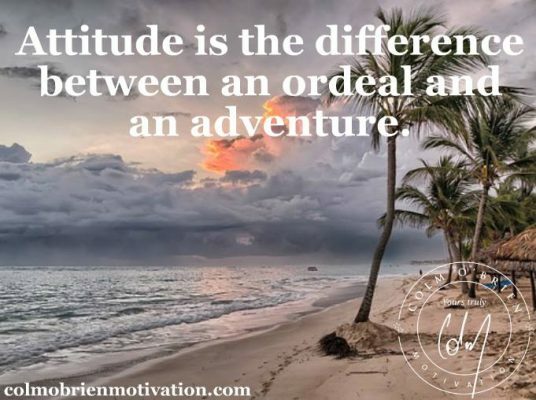 The COBM post earlier in the week suggesting that “Attitude is the Difference Between an Ordeal and an Adventure” got a lot of attention and comment, probably because most of us would agree that it is true. You see life is tough; life is full of problems. Every morning that you and I are privileged to wake up, we do so knowing full well we are going to have to handle some stuff before we crawl back into the scratcher. And the reason I say it is a privilege to wake up is because, well… think about the alternative? Hello! Back to Stradivarius. “…weather-beaten wood makes the sweetest music.” I think this also applies to life. I think the sweetest humans on the planet are possibly those who have had to handle the most – who have weathered some terrible storms in their lives. And if Stradivarius is to be believed, those of us that have weathered the biggest storms should, ‘make the sweetest music’. The secret, if there is one is to make friends with the fact that life is about solving the problems that come our way by virtue of our very existence. Doing so keeps us vital, keeps us strong, keeps us alive. I’ve had days too where I would like nothing better than to pull the covers over my head and go back to sleep; write the day off, but that is no solution, certainly not a long term one. Our job as such is to overcome challenges and in doing so we make a difference in our own lives and oftentimes the lives of others too. If you apply this to your career, your ‘job’ is to solve the problems that are above the pay grades of your reports! Without problems to solve, we wouldn’t be needed… interesting isn’t it? Perhaps we should change our attitude to problems purely based on this fact alone? The relentless onslaught of problems of course can at times become frustrating and in severe cases can prove overwhelming and in a few regrettable cases, prove just too much. But the reality is that most problems are handle-able, most problems are solvable over time and the key to it is to know that you’ll overcome! And you already know that you will overcome, don’t you? Because you are reading these very words. That means, because you are human and alive that you must have overcome everything life has thrown at you to date, doesn’t it? Of course it does. To get thus far you have had to overcome some challenging, perhaps terrible, stuff, and you have. And so have I. So, we are going to be fine you and I. The secret going forward is to learn to dance with life. There is a form of martial arts, known as aikido – a Japanese martial art performed by flowing with the motion of the attacker rather than opposing it straight-on. Imagine an agressor comes upon you and instead of fighting him, you, as an aikido trained professional, ‘dance’ with the his movement and use his own momentum and mass against him; effectively deflecting and ultimately prevailing over his attack. Sounds beautiful doesn’t it? I think so. Perhaps that’s what we should be doing with life? Perhaps we need to learn to dance with life and tip toe and shuffle, shimmy and moonwalk through and around life’s curve balls? What do you think? Worth a shot? The alternative is to remain in your own way, to allow yourself be relentlessly buffeted by life’s storms, gritting your teeth into a bitter twisted smile that fools no-one. You may have heard a version of “I used to complain I had no shoes until I met a man with no feet.” but the reality is there is always, always, always someone worse off than you or I and I feel we need to become a little more grateful for the good stuff that is going on in our lives. I’d like to propose to you that for the next seven days that you embrace the adventure that is your life. Wake up knowing that you are going to have to handle stuff, make peace with it, make friends with it, dance with it and have the adventure of your life, knowing full well that you can handle anything life throws your way. In conclusion, the best way of getting this stuff in perspective is to have a purpose in life, to know why you exist, to be clear on what your mission is. Once you know, once you have the vision, the rest becomes easy. Once you are clear on the life you want to lead, the legacy you want to leave, the problems will become stepping stones rather than stumbling blocks in your path. What is the Big Rock for you around this topic of Ordeal V Adventure? What is your soul saying you need to do, or consider? What One Thing can you do this week that will have the biggest positive impact on your Adventure Big Rock? Will you commit to doing it? I hope so. Thanks for thinking with me you.